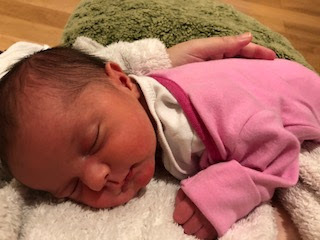 I almost can't believe how much I adore this little girl already - she's two weeks old today and my husband has gone back to work today for the first time after his paternity leave finished. I've spent today feeding, cuddling, changing (several) nappies, sterilising bottles, expressing milk, and generally attending to her every need - it felt something of an achievement today that I also managed to get dressed, eat breakfast and lunch, sign up to the childcare voucher scheme and add her to my medical insurance plan and write a birthday card to a friend - and now a blog post as well! Still, it's a far cry from my busy 'previous life' working in communications at an investment bank - though I'm loving every minute of being Sophie's mum, even when she does one of 'those' nappies! So regular readers should expect lower frequency of blog posts from now on, though I do have plenty of recipes I want to share from when I had gestational diabetes during pregnancy and a few other things I made a while ago - I can't see myself doing any baking any time soon, and even the dinners I'm making at the moment are either frozen food (things with chips), ready meals or from the batch cooking I did while I was pregnant! I do intend to continue this blog and it will probably take on a more child-oriented stance but I also plan to continue my normal sort of posts.... when I can find the time! Sophie is gorgeous, congratulations to you all. I guessed this maybe the reason you hadn't blogged for a while. Enjoy your time with your new baby and look forward to your posts when you are able. Congratulations Caroline! She is gorgeous and I remember when I had my first child. We at a lot of ready meals and chips for a while too! Congrats to you and your husband! She is a beautiful little girl!